Former light heavyweight champion Lyoto Machida (pictured) kicked off his UFC middleweight career with a bang (no pun intended). While his highlight reel head kick on Mark Munoz at UFC Fight Night 30 wasn’t nearly as spectacular as the front kick to the face he unleashed on Randy Couture, it still got the job done, nonetheless. There wasn’t much action in the opening minutes of Saturday’s main event, outside of Machida using a few powerful body kicks to set up his finishing move. Munoz put his hands up to block the kick, but it come in over the top of his fingers and grazed the top-side of his dome. Munoz immediately dropped to the ground, with his head bouncing off the canvas to make matters worse. Machida went in for the kill, though knew it was a wrap and refused to unload additional punches on the ground – even though he had every right to. 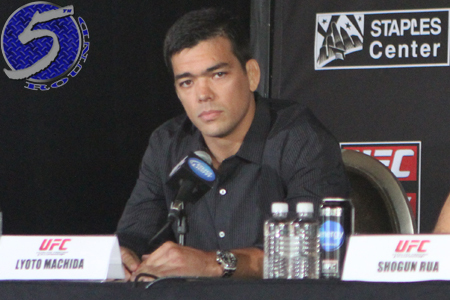 Afterwards, Machida said he didn’t hold back because Munoz was his friend. He did the same thing when he knocked out Ryan Bader last year. The stoppage came at the 3:10 mark in the opening stanza. UFC Fight Night 30 took place inside Manchester Arena in Manchester, England.